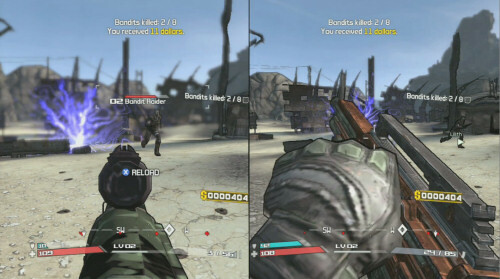 G4TV sat down with Gearbox VP of product development Aaron Thibault, producer Stephen Palmer and game director Matthew Armstrong to discuss Borderlands in a new post mortem. While they get the full story on things we've already heard about - art style, dlc and release dates - there is some new material that's worth a read. Of the most important topics to cooperative gamers is the decision to include split screen play, something that wasn't just an "oh yeah lets do this" moment, but rather a critical design decision. Armstrong: It was actually really important to us because we recognized really early on that this was going to be a word-of-mouth game and a big part of what makes a word-of-mouth game worthwhile is you come in, you sit on the couch and you say "hey, come over and check out this game out and play with me." We wanted people to play with each other so other people would play the game and have that experience. Besides that, it's so co-op centric, that not having split-screen would have felt like a missing feature. Adding co-op feels like an extra feature, but on this project, I suspect it would have felt like a missing feature to not have it. I know split screen is a feature that is constantly asked for by our community everytime a new co-op game is announced, and if developers are reading, I think the above quote really shows you why including it in your game is a good thing. Be sure to check out the full feature at G4TV, it's a solid read for any Borderlands fan. Page created in 0.2490 seconds.